Today’s Yarns for You selection is a novel classic, Vickie Howell’s Sheep(ish). Yarn Facts: Vickie Howell’s Sheep(ish) is a blend of 30% wool and 70% acrylic spun into a versatile, single-ply, workhorse yarn that is soft to the touch but is suitable for projects for the whole family. A true medium worsted weight yarn, it’s machine washable in cold water and should be laid flat to dry. It’s best not to iron this yarn. 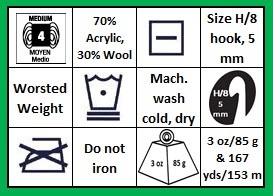 A size H/8 (5 mm) hook is recommended to achieve a 4″x4″ (10 cm x 10 cm) gauge swatch at 17 sc across and 22 rows up. The yarn comes in a very fresh palette of 19 saturated colors that just draw you in and work together very well. I should also mention that there is a related yarn line called Sheep(ish) Stripes that comes in 6 different colorways. What’s this yarn like? I think the color palette is what first attracted me to this yarn. I love how the deep, saturated colors all work together beautifully and spark my imagination. 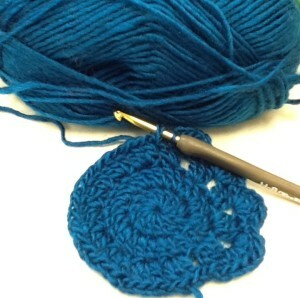 While crocheting, it feels lovely to touch. You know how some acrylics don’t seem like acrylics? Well I would definitely put this yarn into this category. While it retains the easy care, loft, and malleability of acrylic, it draws forward the softness and coziness of wool. I made a lovely coaster in Sheep(ish). I love that this yarn is a single ply yarn. This leads to excellent stitch definition and really lets the beauty of your gorgeous stitches take center stage. There is a bit of a shine to the yarn, and an endearing fuzzy halo that makes your finished product all the cozier. I have worked with this yarn many times and I’ve made things like hats, children’s toys, legwarmers, coasters, and I’ve even incorporated it into my big blanket. I can say that I have never experienced splitting with this yarn, and that it moves pretty well across the hook. Depending upon the ball, I have had trouble ripping my work back, so if you’re working with a smaller hook or a tighter stitch, be aware of that. It’s nothing too terrible, but I personally don’t like to deal with detangling yarn strands when I’m trying to fix a mistake. Additionally, judging by the rounds of my big blanket, which was made of different colors and brands of acrylic, and has since been washed and machine dried many times, I would respect the directions on the label for cold water wash and lay flat to dry. I think my little granny stitches, while still lovely, are a bit melded together from such heat! What Could I Make with This? I think this is great for amigurumi, like the 1-Up Mushroom, warm accessories like the Ribbed Wrist Warmers, and would make super stylish and comfy pillows like Rachel’s Chevron Flower Pillow Cover. I would also recommend this for certain baby items, like these booties, because it can be washed by machine. The only caveat is that you’d need to make sure that the parents understand the item should be dried flat. One more cute pattern idea: Owl Pillow! Should I go shopping for this, and if so, where? I say, sure! This stahsable yarn is widely available at big box stores and online. It retails for $3.99 for a 3 oz/85 g (167 yard/153 m) skein, so I think that’s a pretty good price for what you get. And, since who doesn’t love a bargain, look for sales and use your coupons! (But I didn’t have to tell you that, right?) If you’d like, check out this link to Amazon to get some delivered to your doorstep so you can start your projects! Over all I find this yarn to be great to work with and highly stashable. It doesn’t last long in my house, but luckily it is widely available and reasonably priced as well! Have you worked with Vickie Howell’s Sheep(ish)? If so, what did you think? Which projects do you think would look great with this yarn? Which would you avoid? What other information would you like to know about the yarn? Which yarns would you like to see reviewed on Crochet Spot? Please leave your thoughts, ideas, and points of view in the comments below! This entry was posted on Tuesday, April 22nd, 2014 at 8:04 AM by Caissa "Cami" McClinton	and is filed under Fun Ramblings. You can follow any responses to this entry through the RSS 2.0 feed. You can skip to the end and leave a response. Pinging is currently not allowed. I love this yarn!!!!! It’s one of my favorites to work with. I agree with the review of this yarn. I have used it for a scarf and a hat so far. I plan to use it again! It’s one of my favorite “mainstream” yarns. I’ve made many scarves using it, a baby blanket and soon will start on a chevron full-size blanket. The one thing I don’t like about it is having to deal with it when I’m ripping out mistakes. It gets “tuc k” and tangled and doesn’t unravel easily.